A campaign by Rochdale Borough Council to help residents put the right waste in the correct bin has proved such a success that it is being rolled out to a further area from March in a bid to improve the area’s recycling rates. Rochdale Borough Council could reduce fuel costs for its refuse lorries by as much as a fifth after taking delivery of 10 new environmentally friendly vehicles. 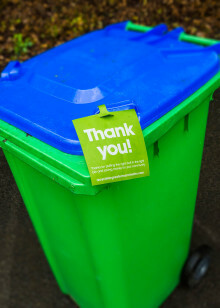 A two-month pilot campaign by Rochdale Borough Council to help residents put the right waste in the correct bin has proved a success. Rather than overfilling bins with the debris of Christmas, Rochdale Borough Council is urging residents to take the environmentally friendly option by composting their waste. Changes to bin collections over Christmas and New Year.